With stores in Castro Valley and San Rafael, Calif., Bullseye USA is seeing a surge in small handgun sales. Why? California handgun options are restricted to that state’s “approved list,” but within that parameter, smaller models by Kahr, Ruger and Sig Sauer are doing well. At the Gardnerville, Nev., store, the Glock 42 is a big seller, at $480. “When we can get them in!” Jacob added. Handguns haven’t been the only thing moving for Bullseye. 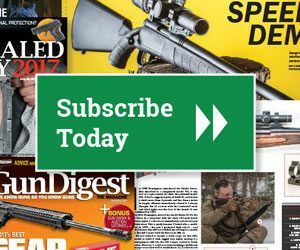 Editor’s Note: This brief originally appeared in the May 15, 2014 edition of Gun Digest the Magazine. Defend Yourself: A Comprehensive Security Plan for the Armed Homeowner by Rob Pincus is the most complete and practical guide to home defense available today. Drawing from experience helping law enforcement, military, private security and people just like you understand how to protect themselves or others, Rob Pincus presents detailed information about planning for, training for and, ultimately, defending yourself and your family from a violent predator inside your home.